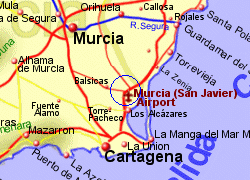 Perhaps best known as the location of Murcia airport (until the new airport at Corvera takes over), the town of San Javier lies just inland of the Mar Menor. 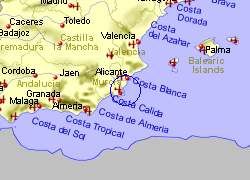 As the town has grown in recentyears it now effectively merges with Santiago de la Ribera on the shore of the Mar Menor, and San Pedro del Pinatar to the north. The surrounding area is mostly flat fertile land growing vegetable crops. 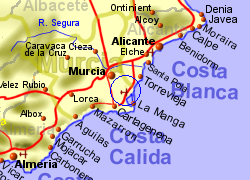 Map of the San Javier area. In the resort "Terrazas de la Torre" is this modern and elegant holiday apartment on the ground floor. On the large terrace you can enjoy breakfast and enjoy the sun in the morning. One of several communal pools is just steps away from your door and within a short time you can reach the legendary desert golf course. The center of the resort offers a club house, a shop and a supermarket, open 7 days a week.